Gwion Llwyd set up his business Dioni Holiday Cottages after returning to live on the farm where he grew up with his own young family. From humble beginnings on the farm’s kitchen table, the entirely web-based lettings business now markets more than 150 luxury holiday cottages across North Wales. 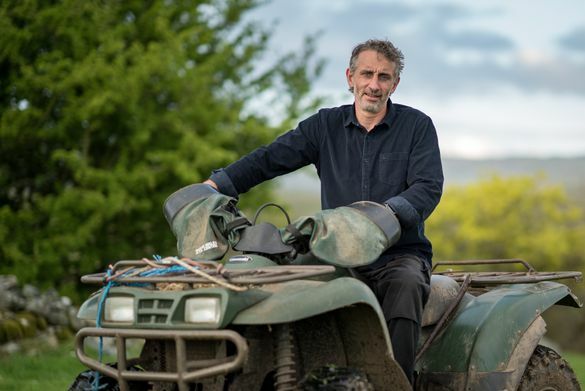 Gwion had grown up on Byrdir Farm – a 200-acre estate in the foothills of the Rhinog mountains – but left after completing A levels at Ysgol Ardudwy to study design engineering at Sheffield University. He subsequently worked as a draughtsman and designer for a number of engineering companies. “I had a great decade or so living away, with stints in Yorkshire, Cheshire and even over to Hamburg. But I always felt the pull to come home. By the time the family returned in 2004, Gwion’s parents had established a bed and breakfast business to supplement the farm’s regular income. Gwion split his time between helping his parents to manage the farm and running the B&B with his wife Louise. But it was the hospitality side of the business which really captured his imagination. It’s also where he saw the biggest potential for growth. The recent ‘Best in Travel’ accolade from Lonely Planet, which tipped North Wales as one of the world’s top regions to explore, and multi-million-pound investment in innovative adventure tourism destinations like Zip World and Surf Snowdonia have seen North Wales become a globally recognised aspirational holiday destination. Overall, tourism is worth a very significant £2bn per annum to the North Wales economy. In 2006, anticipating the trend away from traditional bed and breakfast accommodation to independent self-catering, Gwion converted the farm’s B&B suites into three self-catering studios. Bookings started to roll in. Business development happened organically at first – but as the farm’s holiday lettings began to take off, requests started to come in from friends who wanted Gwion to manage their own holiday lettings too. Friends of friends followed. Formally established in 2008, Dioni’s word-of-mouth style beginnings has informed the ethos of the company as it has evolved. “Dioni has always really nurtured our relationships with our cottage owners, and it’s our approach to them – as well as the quality of the cottages we market on their behalf – that really sets us apart from other holiday cottage lettings agencies. “We took a decision right from the beginning that we would build our business on the strength of our customer service. We don’t ask our owners to sign contracts or commit to working with us for any set length of time because we believe that will happen – and should only happen – as a consequence of us offering an outstanding level of customer service. That’s pretty unique for a holiday cottage lettings company. The company now employs six people, all of whom are passionate advocates of the region. A long-time amateur photographer, Gwion is now an expert in branding and digital marketing. Starting out with just four holiday lets on its books, Dioni now markets more than 150 of North Wales’s finest luxury holiday cottages, with many properties booked up months in advance. The ratio of repeat guests is high at over a quarter of all bookings, and many new bookings come to the company as a result of word of mouth or social media referral from existing guests. The dedicated trail runner, amateur yachtie and former rugby captain says that he thinks people are increasingly looking for a sense of authenticity when they book their holidays. “Our guests are looking for a real ‘place’ – somewhere with a distinctive heritage, culture and community. That sense of having a unique experience, connecting with a region’s landscapes, food and people is an increasingly important part of the holiday. Still a part-time hill farmer, Gwion is also a schools’ mentor for Big Ideas Wales and a former Gwynedd Business Person of the Year. A huge rugby fan, he has captained Harlech rugby team and coached the local youth squad. He is a keen charity fundraiser, and also speaks regularly as an expert on digital marketing for Superfast Business Wales.